On Thursday our netball team played in the Grantham Schools festival to finish off their season. The team were brilliant all afternoon and ended up finishing in 5th place, winning 3 games and only losing one. Well done to all who took part and thanks to the parents who helped with transport and supported us. On Wednesday evening our football teams played two matches against Isaac Newton school. These were always going to be tough matches against the team who are top of the league! However the children were incredible, we ended up losing both matches however myself and Mr Roberts were so proud of the way they played and the effort they put in to the matches. Well done to all of the children who represented our school with pride. On Wednesday evening our football teams played two matches against Gonerby Hill Foot school. The children who played did really well and played some great football, unfortunately we lost both games but we are all proud of the teams as it was the first match for many of the children. We look forward to our matches next week against Isaac Newton School. Last Thursday our netball team were at Priory Ruskin Academy for their latest round of fixtures. Following their success last term they were placed in a tough league and faced some difficult matches. The team lost all 3 matches, however were awarded a victory as one of the schools had to many boys on the court! Mrs Howle was extremely proud of the team and they all played brilliantly. Well done to all who were involved and a big thanks you to Mrs Howle for accompanying the team to the matches. On Monday evening our football team played a match against Belton Lane school. It was a close game between two evenly matched sides, fortunately on this occasion we came out on top with a 2-1 win. Well done to all of those who played and thanks to Mr Roberts for his support with the team. On Tuesday afternoon Mrs Chapman took our Key Steps gymnastics team to Huntingtower school for the Grantham Schools competition. 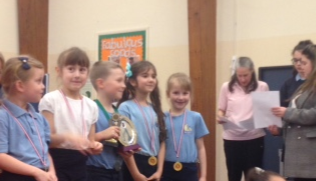 They were brilliant with all 5 children finishing in the top 20 which saw us win the team competition. The children who took part were Levi T, Aleyna A, Lily P, Grace W and Amelia P. Well done to ta all of the children and we look forward to hearing about your future successes! It is certainly is a busy time for our school gymnasts! On Sunday our mixed under 10 team represented Lincolnshire in the Midlands competition in Stamford. They were all amazing and won the competition meaning they now go onto represent the Midlands in the National Championship in Stoke. The team was Holly C, Wojciech, Shania, Natalia, Caelan and Lola. Thanks go to Carol for her work with the team and to all of the parents for their support. A huge well done to all of the children who took part in the Rotary Club Swimarathon last Sunday. Our team managed to swim a grand total of 285 lengths in 55 minutes which is an incredible achievement. Many thanks to Miss Steeples for organising the team and accompanying them at the Mere’s and to all of the parents who offered their support.